It has been six years since the last Daniel Lioneye album. 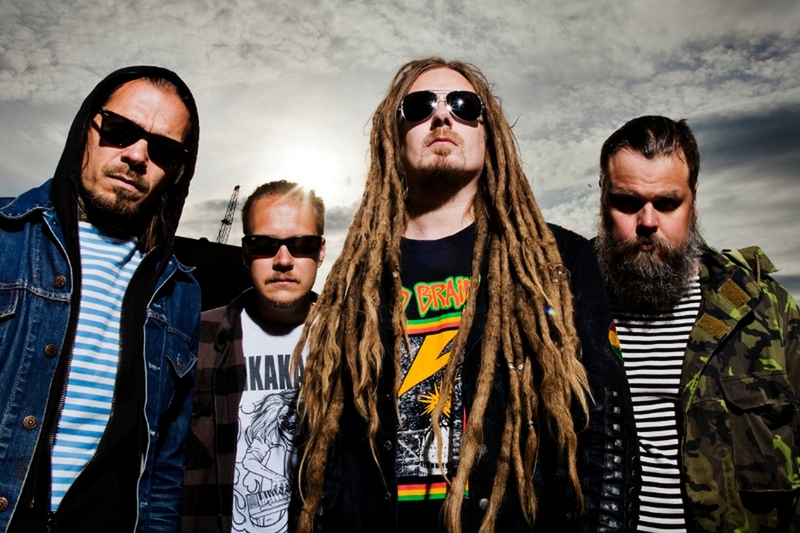 The band is fronted by HIM guitarist Linde Lindstrom, who handles vocal and guitar duties for Daniel Lioneye. The rest of the lineup includes his HIM bandmates Mige and Burton on bass and keyboard, respectively, along with drummer Seppo Tarvainen. Their latest album is Vol. III. I caught up with Lindstrom about Daniel Lioneye’s new album and other topics. Chad Bowar: How did you put together the lineup for Vol. III? Linde Lindstrom: Back in 2011, following the release of Vol. II, we did some shows in Finland and a long U.S. tour supporting Cradle of Filth with this lineup and everything just felt right. It was obvious for me that this was going to be THE lineup for Vol. III. How did the songwriting process compare to the first two Daniel Lioneye albums? The King of Rock ‘n Roll was written, recorded and mixed in five days while being very drunk. On Vol. II, some of the songs were written when I was a teenager and some of them were new. It was a very different approach compared to the first album and that was the whole idea. After we finished the Vol.II 2011 tour, riffs and ideas started to appear. I made Pro Tools demos and sent them to the band. My almost onomatopoeic demo lyrics didn’t make much sense, so Mige rewrote them. How has the band’s sound evolved on this record? I think it has evolved a lot. And in a good way. I still really love the way the first album sounds, especially the mastering of that album is amazing. Vol. II sounds pretty fucked up but then again, that was the whole point. It’s a pretty challenging album I admit. It works best with good headphones, volume up while being high. This album is easier to approach than Vol. II. The band is loose, groovy and tight at the same time. You can hear the band playing, which is rare these days. Also, I was more confident with my vocals so you can actually hear them. Like I said earlier, Mige did most of the lyrics. We’re on the same frequency so they still feel very personal to me. Existential crisis/depression is one of the themes of the album. How is the 2016 version of “Neolithic Way” on this album different than the original version? I think that “Neolithic Way” stood out most on Vol. II and it didn’t get the treatment it deserved. In Finland we have this thing called “juostenkustu.” That’s what it sounded like to me on Vol. II. We took the tempo down a bit and the vocals are more audible among other things. It also helped that we played this song live quite a few times on the 2011 tour. I’m so glad we did it again. Very pleased with the new version! A lot has changed in the music industry since your last Daniel Lioneye album. How do you go about setting expectations for an album? I don’t set any expectations at all. How could I? Just have to take it as it comes. With your other obligations, how much touring will you be able to do for this record? We will play five shows in Finland in the beginning of September and some European dates are on the works. That’s all I can say at the moment. What has been your most memorable Daniel Lioneye live show? The whole 2011 U.S. tour was amazing! Great shows and so many great memories! Getting to know the Nachtmystium guys was one of the highlights. If I have to pick one show, it would probably be the one at Nokia Theatre in New York. You’re doing a guitar master class in Russia in September. How rewarding is it to pass along your knowledge to others? It’s very rewarding. I’m looking forward to this trip! Who are some guitarists of the younger generation that you think have a lot of talent? I’m not sure what is meant by younger generation, but to be honest, I’m not blown away by any new guitar players. Where are they? Maybe I don’t follow new music actively enough. When I try to think of any interesting young guitar players, nothing comes to mind. Might be my fault, though. What’s the status of the next HIM studio album? I don’t have any news about that, I’m afraid. Well, I hope you enjoy the new album and thank you very much for this interview!